Welcome back to The Cookie Elf File! About once a week, The Elf will send you a favorite cookie recipe, complete with a list of ingredients and instructions. The Elf will also occasionally include baking tips from The File to help you bake and enjoy homemade cookies in your own kitchen. At the beginning of a new year, The Elf wants things to be easy and simple in the kitchen. You probably do, too. 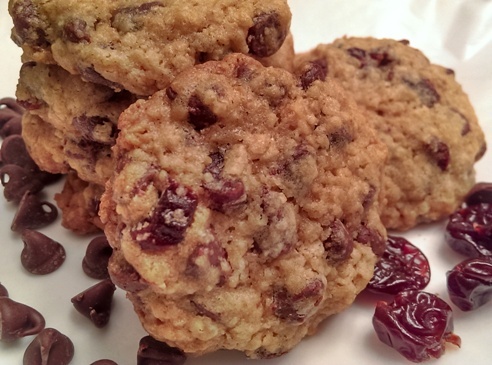 Fran’s Cherry Chocolate Chip Cookies, a variation of oatmeal chocolate chip cookies, taste like they are made from scratch. But the recipe starts with a simple mix (a cookie mix rather than a cake mix), one readily available in grocery stores – with just a couple of additions.